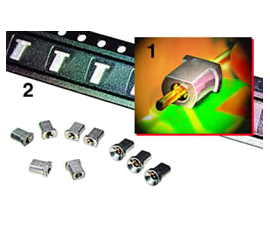 At the heart of the Mill-Max product line are precision machined miniature pins and receptacles, typically found in interconnection applications on printed circuit boards and cables. Mill-Max high speed turning can consistently produce precision machined pins to tight tolerancees of +/- .0005" on critical features that are essential to the part function. This repeatability is evident on runs of one thousand to several million precision machined pins. Our unique high speed precision machining can turn pin diameters as small as .008" and as large as .250" in diameter. In addition to high speed turning and drilling, our machines can perform both milling and cutting operations to create multi-faceted geometry features on specific locations along the pin barrel. Hexagon, square, vent, fork, blade, and solder cup profiles are often used for board retention and component assembly purposes. Press-fit features for insertion into plated through holes on multi-layered printed circuit boards. A machined flat surface used for surface mount pick and place assembly out of a tape and reel pocket. Mill-Max utilizes Brass Alloy for most customer requirements. Brass has tensile strengths very similar to steel, but gives the ability to machine more efficiently allowing us to keep costs down. Other alloys such as Tellurium Copper are available for large power pin applications. For customers who require a greater modulus of elasticity we offer Phosphor Bronze. High-speed precision turning and drilling operations create seamless holes into solid brass rod stock. The advantage of this construction becomes evident when soldering a socket receptacle. The seamless shell construction prevents solder from wicking into the inner cavity rendering the part unusable. One of the great advantages of machined pins is that there are no large NRE costs, long lead times, or large initial run requirements typically associated with stamping die sets. Prototype run quantities can be as low as 1,000 pieces and typical delivery starts in 5 - 7 weeks depending on the complexity of the part. 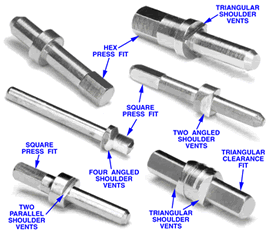 Pins are machined to tolerances of +/-.0005" for critical to function features. Multi-Facet (polygon) geometries for press-fit and surface mount applications. Cost Efficient Brass Alloy for production runs, other alloys available. Seamless construction eliminates solder from entering the part. Specific industry applications of hi-speed precision turned pins and receptacles can be found in the Mill-Max New Products Section of our website. There you will find new and exciting product designs for applications such as LED Lighting, Image Sensors, Spring Pins, and Medical Cables, to list just a few. Start your search using our product finder now, or contact a Mill-Max Applications Engineer today and let us show you how our precision high-speed turning technology can address your interconnect requirements reliably, economically and efficiently.